Use our bamboo and plastic rice paddles in the cooling down process of making sushi. Find traditional-style Shamoji sushi rice paddles at Everything Chopsticks. 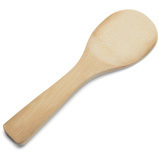 The bamboo rice paddle is used in the cooling down process of making sushi rice. This is important to keep your rice becoming too sticky. Traditional bamboo sushi paddle. Never put a bamboo rice paddle in the dishwasher. 8 inches long. Made in China. 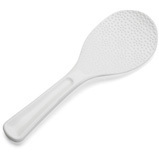 This plastic rice spatula is used in the cooling down process of making sushi rice. This is important to keep your rice becoming too sticky. Knobby spatula surfaces. Easy to clean and dishwasher safe. 7.75 inches long. Made in Japan.